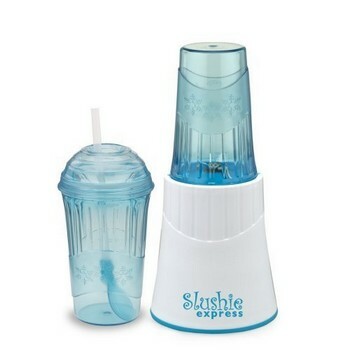 Ok, I actually make smoothies with it but the manufacturer calls it a slushie maker . $15 at Wal-Mart. I make a 50 calorie, 12 ounce chocolate milkshake! Who doesn't love a 50 calorie chocolate milkshake that gives you calcium! With sugar-free "syrups" that are coffee flavorings, sugar free drink mixes you pour in bottled water, flavorings from your spice rack, Almond Breeze 'milk,' Dannon Light & Fit vanilla yogurt that is just 80 calories a cup, protein powders, fruit, the possibilities are endless and filling and delicious! Two packets diet Swiss Miss hot cocoa mix, 1 cup water, and ice to make two cups. Blend and enjoy. YUM!!! Adding a tablespoon instant chocolate pudding mix makes it extra creamy and delicious for only 25 more calories. Use frozen fruit instead of ice. The packets of drink mixes you add to bottled water, add one packet, one cup water and ice to make two cups, blend and enjoy.